Rux Martin/Houghton Mifflin Harcourt, 9780618829255, 240pp. 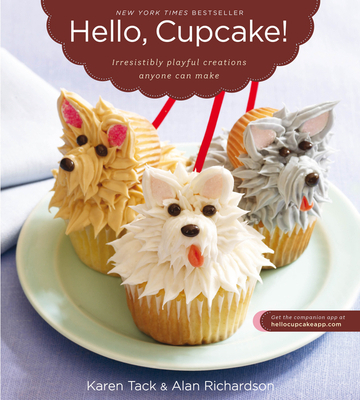 Witty, one-of-a-kind, imaginative cupcake designs using candies from the local convenience store, no baking skills or fancy pastry equipment required. Spotting the familiar items in the hundreds of brilliant photos is at least half the fun. Called “the cake whisperer” by Gourmet, KAREN TACK is a cooking teacher and food stylist. Her work can be seen on the covers of Gourmet, Bon Appétit, Good Housekeeping, Family Circle, Woman’s Day, Martha Stewart Living, Parents, Real Simple, Nick Jr., and many others. Fellow creator ALAN RICHARDSON has photographed dozens of best-selling cookbooks, and his work appears in many leading food and women’s magazines. He is the coauthor of The Breath of a Wok, which won two coveted awards from the International Association of Culinary Professionals.